In search of tokusatsu fans and merch, Team TokuNet social media manager Amber attended the Atlantic City-based convention, AnimeNEXT. This past weekend, AnimeNEXT 2017 was hosted in the beautiful Atlantic City Convention Center from Friday, June 9th to Sunday, June 11th. The convention mainly focuses on anime and the anime industry but still appreciates fans of all genres. 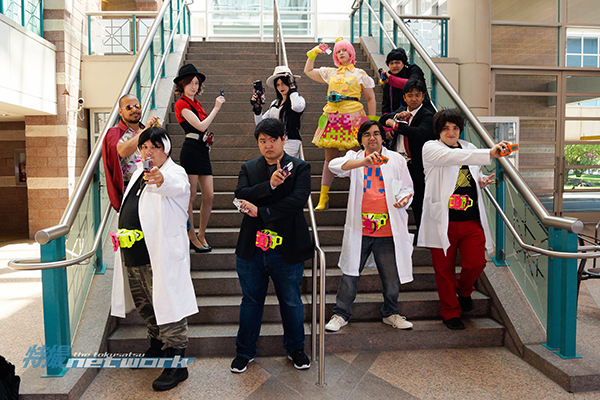 On Saturday morning of the convention, a tokusatsu cosplayer meet up was hosted by Grapefruit Soda Cosplay, who has been hosting these meetups since 2012. The meetup was filled with enthusiastic Kamen Rider fans, including myself, who cosplayed their favorite characters. It was great to meet other passionate fans who were excited about the shows they loved. Inside the Exhibition Hall were rows of various vendors for all types of fans. For a tokusatsu fan, there were several vendors selling current and vintage merchandise. One vendor had an assortment of old-school Power Rangers and Godzilla toys. Another vendor had the latest gashats and henshin devices from Kamen Rider Ex-Aid along with belts from more recent seasons like Kamen Rider Drive. AnimeNEXT was a fantastic convention to attend as a tokusatsu fan. Though our fandom may be small compared to others, we are widely represented at conventions like these with cosplayers and vendors showcasing their love for the genre. If you are in the area, I highly recommend attending this convention and celebrating your love of tokusatsu with the rest of us. All photos were taken by ShadowFX Productions. Please do not repost or alter in any way without permission and proper credit.